Did you know there was a real person named Claire Burke? 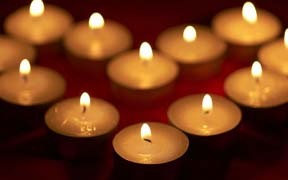 She was an interior designer of the country’s most prestigious homes in the southeast. Claire Burke turned a love for flowers and herbs into a business. She began mixing dried flowers and herbs in her bathtub and back porch and eventually moved her operations to an old brick house. Her own combinations of botanical elements and complex fragrances became her trademark, and it can become yours too. I love how potpourri has changed over the years. 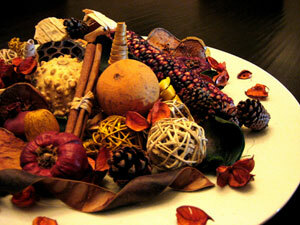 Now the botanicals in potpourri are “chunky” and visually very interesting in shape, texture and color. 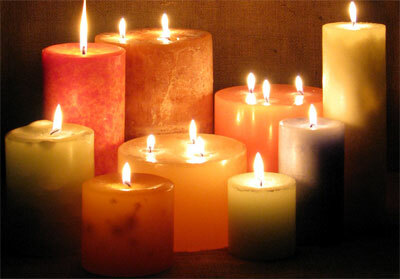 I buy all the new Claire Burke scents that are introduced and try them in different rooms of my home. As you know, the scent of potpourri does not last forever, thus, I use refresher oils to boost the fragrance impact again. I’m a saver, so when the scent has dissipated, I put my favorite botanical elements in a zip lock bag and save them for another time. As the seasons change I create my own potpourri blends using my favorite botanical shapes, colors and textures that I have collected. 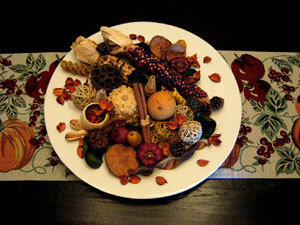 As the season transitioned from summer to fall harvest this year, I created my own blend of potpourri using botanicals from 2 different Claire Burke blends, and added some plastic blackberries. 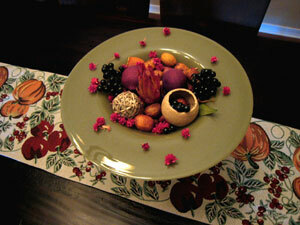 I used refresher oil from last year’s fall fragrance Blackberry Cassis to refresh this potpourri. Now that fall is upon us, I have changed my décor to reflect fall harvest using pumpkins, gourds, corn, and a variety of botanical elements from previous years Pumpkin Strudel potpourri and Applejack & Peel Potpourri. 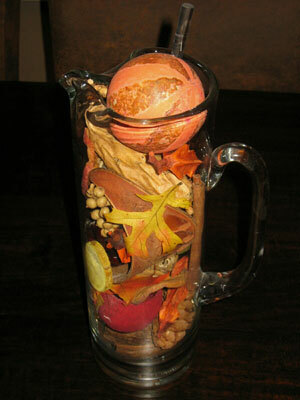 I used an oversized Claire Burke potpourri plate from years ago to create my “cornucopia” of fall goodies and have scented it this year with Slice of Spice refresher oil. Yummie! Be creative, break the rules, and have fun with color and shapes. Don’t just pour the potpourri in the bowl and call it good. Arrange the pieces so you have interesting shapes together, group botanicals in threes to be artistic, and place botanicals so your arrangement has dimension. Try this! I have a glass martini mixer that I never use, so I pulled it out of my china cabinet and filled it with fall leaves and Pumpkin Strudel potpourri botanicals that I saved from last year. The large botanicals, especially pine cones, are perfect for absorbing the refresher oil and making a lasting scent. So be creative, and make it your way! 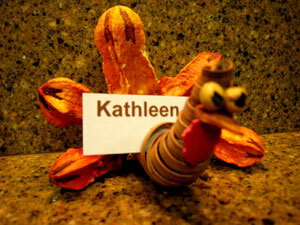 Two years ago I made place cards for my Thanks-giving table entirely made from various pieces of potpourri!